Cold War Kids are an American indie rock band from Long Beach, California. Band members are Nathan Willett (vocals, piano, guitar), Matt Maust (bass guitar), David Quon (guitar, backing vocals), Matthew Schwartz (keyboards, backing vocals, guitar, percussion), and Joe Plummer (drums, percussion). Former members of the band include Dann Gallucci (guitar, keyboards, percussion), Matt Aveiro (drums, percussion), and Jonnie Russell (guitar, vocals, piano, keyboards, percussion). The members of Cold War Kids met at Biola University. They formed a band in 2004 when they would meet regularly in Jonnie Russell's apartment above a restaurant called Mulberry Street in downtown Fullerton. Maust came up with the band's name around 1997, during his travels in Eastern Europe with his brother, where they found a park in Budapest with missing statues, taken away after Communism fell. Seeing that there was a playground in the park, Maust said "...being in that environment just made the phrase 'Cold War Kids' pop into my head. I may have heard it before. I'm a Cold War kid, too – I was born in 1979." Maust used the name for his personal website, but then he repurposed it after the band decided to use the name. The band relocated to Whittier, California, and began recording their first demo, which Monarchy Music released as the EP Mulberry Street (based on the restaurant where they regularly met) in spring 2005. Between tours, the band released two more EPs: With Our Wallets Full and Up in Rags, in 2006. Monarchy Music would re-release those EPs as one compilation album titled Up in Rags/With Our Wallets Full in 2006. In summer 2006, Cold War Kids signed with Downtown Records and started work on their debut album. The album titled Robbers & Cowards was released on October 10, 2006, with sales close to 200,000 copies. Critics were impressed with the band's blues rock sound and lyrics that told morose tales of yesteryear: Joe Tacopino of PopMatters said that "These ambitious youngsters are definitely worth the trip, even without the ostentatious vocal harmonies." Jeff Weiss of Stylus Magazine called the album "[It’s] a good debut, maybe even a very good one. Whether or not this band will achieve greatness remains anybody’s guess." One of the album's biggest detractors came from Marc Hogan of Pitchfork, who criticized the band for its songwriting, melodies, and Christian symbolism, saying that "Robbers and Cowards insults our intelligence a few times too often." Cat Dirt Sez of the San Diego CityBeat said that Hogan's review was an example of lazy journalism, with lead guitarist Jonnie Russell saying that the reviewer wanted a wittier approach to the album rather than a thoughtful assessment of it. Cold War Kids' second album, Loyalty to Loyalty, represented a departure from its debut, featuring a lot of narrative storytelling, as well as political and philosophical references. In an interview with NPR, Nathan described the songwriting process for the album: "The choices that we make have always been organic ones, to try to grow at a rate that makes sense," Willett says. "Not necessarily talking about, 'Is there a great single? Is this a big breakthrough for us? Is this the next level for us?' But just write songs. Yeah, there is a stress, and the way we deal with it is to ignore it." Loyalty to Loyalty was released on September 23, 2008, to generally positive reviews from critics. Bart Blasengame of Paste called it "a better-than-solid album from a band that seemed equipped to someday make a classic one." James McMahon of NME said that "Almost in defiance of poor sales and cult following, CWK and their charming second album embody everything you hoped music might be." Cold War Kids spent the end of 2008 and most of 2009 on the road touring for Loyalty to Loyalty, highlighted by a national tour with Death Cab for Cutie. In between touring, the band returned to the studio to record what would become their seventh EP, Behave Yourself. In an interview with Flavorwire, Maust talked about the differences between this and Loyalty to Loyalty: "It’s basically the happier, more vibrant songs that didn’t really fit on the [Loyalty] album. We realized that in a way, we were starting to work ahead of ourselves, so this [EP] works as a nice bridge between records." Behave Yourself was released digitally on iTunes on December 21, 2009, and given a physical version on January 19, 2010. Mine Is Yours was released on January 25, 2011, and garnered mixed reviews from critics. Billboard said that "the band has emerged with a set that's more inviting than its first but just as catchy." Sean O'Neal of The A.V. Club said that the album has "the bland sound of a band trading identity for ambition." 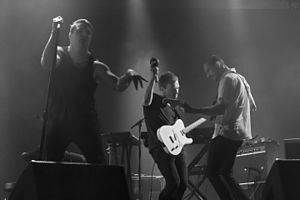 Cold War Kids supported the album with a spring tour across North America that included festival appearances at Bonnaroo and Coachella. On February 2012, the band announced that lead guitarist Jonnie Russell left the band due to personal reasons. On October 31, 2016, Cold War Kids released a single called "Locker Room Talk", as part of the 30 Days, 50 Songs project protesting Donald Trump's presidential run. The band stated that "At this point in the game, taking a shot at Trump almost feels unnecessary. Too easy. More negativity. We're all so tired of him. But when I heard Death Cab's song, I realized that's a mistake. It’s important to state the obvious, to express those feelings in a song. Even if it's maybe redundant, it feels great to let it all out!" ^ "Cold War Kids Joins Capitol Records Family". Capitol Records. Retrieved February 2, 2017. ^ "Interview: A Chat with Nathan Willet from Cold War Kids". 18 April 2017. Retrieved 27 May 2017. ^ a b Stereogum Staff (January 18, 2007). "Christianity And The Cold War Kids Backlash". Stereogum. SpinMedia. Retrieved December 6, 2014. ^ Marchese, David (March 2011). "Why They're Called... Cold War Kids". Spin. SpinMedia. Archived from the original on March 20, 2011. Retrieved April 16, 2017. ^ Stern, Marlow (April 17, 2013). "Cold War Kids on Faith, Hipster Detractors & Their Musical Revolution". The Daily Beast. Retrieved April 30, 2014. ^ Tacopino, Joe (October 30, 2006). "Cold War Kids: Robbers & Cowards Review". PopMatters. Archived from the original on November 30, 2006. Retrieved April 30, 2014. ^ Weiss, Jeff (October 13, 2006). "Cold War Kids – Robbers and Cowards – Review". Stylus Magazine. Archived from the original on January 3, 2008. Retrieved April 30, 2014. ^ Hogan, Marc (October 19, 2006). "Cold War Kids: Robbers and Cowards". Pitchfork. Retrieved December 6, 2014. ^ Carroll, Cory (September 16, 2008). "Cold War Kids' Nathan Willett on 'Loyalty to Loyalty' – BlackBook". Black Book Magazine. Archived from the original on September 30, 2008. Retrieved April 4, 2010. ^ Bordal, Christian (September 23, 2008). "Cold War Kids: Pondering Personal Politics". NPR. Retrieved July 30, 2014. ^ "Loyalty To Loyalty Reviews". Metacritic. CBS Interactive. Retrieved May 12, 2014. ^ Blasengame, Bart (September 22, 2008). "Cold War Kids: Loyalty to Loyalty – Review". Paste. Retrieved May 12, 2014. ^ McMahon, James (September 17, 2008). "Album Review: Cold War Kids – Loyalty to Loyalty (V2)". NME. IPC Media. Retrieved July 10, 2011. ^ Dombal, Ryan (January 27, 2009). "Death Cab for Cutie Announce Spring U.S. tour". Pitchfork. Retrieved April 29, 2014. ^ Dambrot, Shana Nys (January 18, 2010). "The Art of Cold War Kids Bassist Matt Maust". Flavorwire. Flavorpill Media. Retrieved April 30, 2014. ^ "iTunes – Music – Behave Yourself – EP by Cold War Kids". iTunes (US). Apple. December 21, 2009. Archived from the original on March 29, 2011. Retrieved April 30, 2014. ^ Lieu, Lynn (January 4, 2010). "News – Q & A: Cold War Kids (Part 1)". Filter. Retrieved April 4, 2010. ^ "Mine Is Yours Reviews". Metacritic. CBS Interactive. Retrieved May 7, 2014. ^ "Cold War Kids, "Mine Is Yours"". Billboard. Prometheus Global Media. February 19, 2011. Archived from the original on November 6, 2013. Retrieved May 12, 2014. ^ O'Neal, Sean (February 1, 2011). "Cold War Kids: Mine Is Yours · Music Review". The A.V. Club. The Onion. Retrieved May 14, 2014. ^ Duncan, Michael (December 1, 2010). "Cold War Kids Reveal Spring Tour Dates". Rock Edition. Retrieved April 4, 2014. ^ Sciarretto, Amy (February 16, 2011). "2011 Bonnaroo Music and Arts Festival Lineup Announced, Includes Eminem, Wiz Khalifa, Best Coast, Loretta Lynn, Cold War Kids". Artistdirect. Rogue Digital, LLC. Retrieved May 14, 2014. ^ "Cold War Kids 2011 Coachella Performance (Video)". The Audio Perv. April 18, 2011. Retrieved May 14, 2014. ^ Seidman, Lacey (April 15, 2013). "Exclusive Interview: Cold War Kids Rebound After Losing Their Guitarist With Dear Miss Lonelyhearts". VH1. Retrieved May 13, 2018. ^ Brown, August (January 17, 2012). "Cold War Kids give away new single, debut new guitarist". Los Angeles Times. Tribune Company. Retrieved May 14, 2014. ^ Cosores, Philip. "Cold War Kids: Dear Miss Lonelyhearts". Paste. Retrieved April 3, 2013. ^ Coplan, Chris (August 15, 2013). "Cold War Kids announce Tuxedos EP, stream unreleased "Pine St."". Consequence of Sound. Retrieved May 2, 2014. ^ Jackson, Nate (November 7, 2013). "Cold War Kids Prep for a New Record, Realize That Growing Up Means Lightening Up". OC Weekly. Retrieved May 2, 2014. ^ Cosores, Philip (November 10, 2013). "Cold War Kids wrap tour in revamped form". Orange County Register. Retrieved September 8, 2014. ^ "Cold War Kids Create New Track out of Stella Artois Chalices". Creativity Online. March 6, 2014. Retrieved May 2, 2014. ^ StellaArtoisAR (April 10, 2014). ""A Million Eyes". Behind the scenes". YouTube. Google. Retrieved January 26, 2017. ^ a b "A Million Eyes (From Stella Artois – The Chalice Symphony) – Single by Cold War Kids". iTunes Store (US). Apple. Retrieved March 18, 2014. ^ "The Chalice Symphony Presents: Cold War Kids – A Million Eyes". YouTube. April 4, 2014. Retrieved May 2, 2014. ^ "LISTEN: A Cold War Kids Project, French Style Furs, Releases New Music". Filter. May 1, 2014. Retrieved May 2, 2014. ^ "Cold War Kids enlisted on many fronts". The Upside News. September 18, 2014. Retrieved October 28, 2014. ^ "Cold War Kids Announce New Album 'Hold My Home' – Release "All This Could Be Yours" Video". Glide Magazine. August 26, 2014. Retrieved August 26, 2014. ^ "Cold War Kids on Instagram: "Backstage in Brazil . Welcome to our great friend and new guitarist Dave Quon. We recently parted ways with our mate Dann Gallucci . We…"". Instagram. Retrieved 23 February 2019. ^ "30 Days, 50 Songs". Retrieved November 1, 2016. ^ Andrew Trendell (2 February 2017). "Cold War Kids unveil new single and video for 'Love Is Mystical'". NME. Retrieved 23 February 2019. ^ Phares, Heather. "Cold War Kids – Artist Biography". AllMusic. Retrieved August 7, 2014. ^ a b "Cold War Kids – Chart History: Billboard 200". Billboard. Prometheus Global Media. Retrieved February 15, 2013. ^ "Cold War Kids – Chart History: Alternative Albums". Billboard. Prometheus Global Media. Retrieved February 15, 2013. ^ "Cold War Kids – Chart History: Rock Albums". Billboard. Prometheus Global Media. Retrieved October 30, 2014. ^ a b "Discography Cold War Kids". Australian Charts. Hung Medien. Retrieved June 19, 2011. Hold My Home: Ryan, Gavin. "Slipknot Land No 1 Album On ARIA Chart". Noise11. Retrieved October 28, 2014. ^ "Discographie Cold War Kids". Austrian Charts. Hung Medien. Retrieved June 19, 2011. ^ a b "Discografie Cold War Kids". Ultratop. Hung Medien. Retrieved June 19, 2011. ^ "Discographie Cold War Kids". Ultratop. Hung Medien. Retrieved June 19, 2011. ^ "Discographie Cold War Kids". French Charts. Hung Medien. Retrieved June 19, 2011. ^ a b "Discografie Cold War Kids". Dutch Charts. Hung Medien. Retrieved June 19, 2011. Robbers & Cowards and Loyalty to Loyalty: "Cold War Kids" (select "Albums" tab). British Phonographic Industry and Entertainment Retailers Association. Retrieved January 12, 2013. Mine Is Yours: Zywietz, Tobias. "Chart Log UK – 2011". zobbel.de. Tobias Zywietz. Retrieved January 12, 2013. Dear Miss Lonelyhearts: Zywietz, Tobias. "Chart Log UK: New Entries Update – 13.04.2013 (Week 14)". zobbel.de. Tobias Zywietz. Retrieved April 14, 2013. ^ "Robbers & Cowards – Cold War Kids". AllMusic. Retrieved December 11, 2013. ^ "Loyalty to Loyalty – Cold War Kids". AllMusic. Retrieved December 11, 2013. ^ "Mine Is Yours – Cold War Kids". AllMusic. Retrieved December 11, 2013. ^ "Dear Miss Lonelyhearts – Cold War Kids". AllMusic. Retrieved December 11, 2013. ^ "Hold My Home – Cold War Kids". AllMusic. Retrieved October 30, 2014. ^ "iTunes Live from SoHo by Cold War Kids". iTunes Store (US). Apple. Retrieved December 11, 2013. ^ "Audience Live by Cold War Kids". Capital Records (US). Retrieved April 13, 2018. ^ "Cold War Kids – Up In Rags, With Our Wallets Full (Vinyl, LP)". Discogs. Retrieved April 4, 2014. ^ "We Used To Vacation EP – Cold War Kids". AllMusic. Retrieved December 11, 2013. ^ Carino, Paula. "At Fingerprints – Cold War Kids". AllMusic. Retrieved January 12, 2013. ^ "Live from the Paradiso – Cold War Kids". AllMusic. Retrieved January 12, 2013. ^ Phares, Heather. "Behave Yourself – Cold War Kids". AllMusic. Retrieved December 11, 2013. ^ "Cold War Kids – Live At Third Man (Vinyl, LP, Album)". Discogs. Retrieved April 4, 2014. ^ "Tuxedos – EP by Cold War Kids". iTunes Store (US). Apple. Archived from the original on November 14, 2013. Retrieved December 11, 2013. ^ "Cold War Kids – Five Quick Cuts (Vinyl, 10", Special Edition, Record Store Day 2015)". Discogs. Retrieved July 5, 2015. ^ "Los Feliz Blvd – EP by Cold War Kids on Apple Music". Apple Inc. Retrieved July 28, 2017. ^ "Cold War Kids – Chart History: Hot 100". Billboard. Retrieved December 11, 2013. ^ a b "Cold War Kids – Chart History: Alternative Songs". Billboard. Retrieved February 15, 2013. ^ a b "Cold War Kids – Chart History: Rock Songs". Billboard. Retrieved February 15, 2013. ^ "Cold War Kids – Chart History: Canadian Hot 100". Billboard. Prometheus Global Media. Retrieved October 3, 2015. ^ "Billboard.biz". billboard.com. Retrieved 3 February 2018. "Hang Me Up to Dry": "Cold War Kids". British Phonographic Industry and Entertainment Retailers Association. Retrieved January 12, 2013. "Hospital Beds": Zywietz, Tobias. "Chart Log UK: Chris C. – CZR". zobbel.de. Tobias Zywietz. Archived from the original on May 7, 2012. Retrieved January 12, 2013. ^ "We Used To Vacation – Cold War Kids". AllMusic. Retrieved December 11, 2013. ^ "Cold War Kids – Chart History: Bubbling Under Hot 100". Billboard. Prometheus Global Media. Retrieved December 11, 2013. ^ "Modern Rock – Airplay Archive". FMQB. Mediaspan Online Services. Archived from the original on March 22, 2013. Retrieved January 12, 2013. ^ a b "Cold War Kids – Chart History: Alternative Digital Songs". Billboard. Retrieved February 11, 2018. ^ a b "Cold War Kids – Chart History: Rock Digital". Billboard. Prometheus Global Media. Retrieved August 13, 2015. ^ "Minimum Day – Single by Cold War Kids". iTunes Store (US). Apple. Retrieved December 11, 2013. ^ a b "Cold War Kids – Chart History: Rock Airplay". Billboard. Prometheus Global Media. Retrieved August 13, 2015. ^ "Cold War Kids – Chart History: Bubbling Under Hot 100". Billboard. Prometheus Global Media. Retrieved August 25, 2015. ^ "American single certifications – Cold War Kids – First". Recording Industry Association of America. If necessary, click Advanced, then click Format, then select Single, then click SEARCH. ^ "Canadian single certifications – Cold War Kids – First". Music Canada. Wikimedia Commons has media related to Cold War Kids.